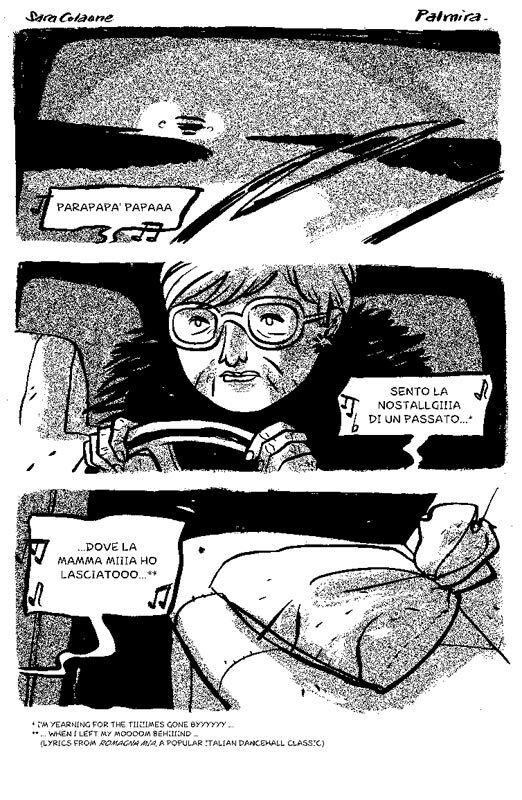 Sara Colaone, comic author, illustrator and animator was born in Pordenone, Italy in 1970. In the field of comics she has been working with the most vibrant Italian publishing houses, such as Kappa edizioni, Coconino Press andAssociazione Vivacomix. She won third place in the Torino, Olympic City illustration competition and held expositions of her original works in Naples, Bologna, Ljubljana, Ravenna, Lugano and Vicenza. She teaches comics and illustration at the Bologna Academy of Fine Arts. I met Sara at her house in Bologna, where she lives and works. Like homes of many other illustrators, hers is an intimate and welcoming space, which she also uses as a studio. Sara is tidy and meticulous; she grants us a sneak peak at the preparatory and final boards for Palmira, the story she has been creating for Stripburger. This is where our conversation begins. Palmira, the story you’ve been making for Stripburger, how was it created? For quite some time I had the desire to write a story on baleras (typical north Italian dance halls for liscio, a partner dance; translator’s note). My parents were regular visitors and their experience unveiled to me an element that I hold very dear, namely vitality; the older generation, taking up dancing relives a second youth. I am very fond of the atmosphere: the choice of clothes, accessories, hair styles … It’s almost teen-like, a second adolescence, experienced by the seniors. When circumstances push a couple to part, this balance is destroyed, so they have difficulty finding a new dance partner in spite of the fact that there is an entire movement of widowers, meeting in such spots. I wished to focus more on the upside of the situation and invented a character that is loyal to his second youth as well as to the memory of the person with whom she had experienced it. Another thing I took interest in is attempting to write the story without a previous scenario, but rather focus on direction and montage. I wrote the storyboard directly, basing the story on the series of events as well as the rhythmical emphasis of the image. How has your approach to storytelling changed, considering the fact you first visualized the image series? It has helped me focus on the fluidity of the story. For example; the story contains a number of details with one strong narrative meaning mainly because I set them at the center of the narration. One detail are the main character’s shoes; for a dancer, shoes are a mythical object – shoes are constantly changed, because they cause feet ache, because dance shoes aren’t walking shoes and are unsuitable for driving … Anyone who goes to baleras, usually carries bags of shoes. At the outset, the bag, depicted in one of the first images, becomes a mystery object and instills a feeling of a police novel, since we are unfamiliar with it. Later we learn it’s just a bag with dance shoes, high-heeled, black and very beautiful. It’s an object that defies everyday reality, the common brown loafer. Frivolousness, but also a change of state. Precisely, shoes are the way into a dream dimension, a dream you can touch, a way into a dimension of somebody, who won’t give up a part of his life because of a loss, a part that are dreams, ecstasy and bewilderment. All this can be found precisely in the everyday, for going to baleras is not the same as travelling to Bangkok, it’s something fairly accessible. You’ve built a characterization of a figure that could have been anonymous; however, the figure becomes a person due to a physiognomic feature inside the social status of the groups that meet at such folk venues. Absolutely folk. In fact, I first considered giving the characters a much stronger accent so as to depict ordinary people. This is no elite ball, it’s a folk party, where people make their dreams come true, childhood dreams that is, such as to become a ball princess. A dance hall is a place where the ordinary person becomes a protagonist, if only for a couple of minutes. I enjoyed depicting such situations through ordinary objects. The elderly often have a fixation with objects. They dust them; move them with particular care, all because they present an important part of their life. It’s a form of linking the story to their history. These are particularly representative objects, so I wished to start a discussion on a drawing that would give priority to the physical, drawn narrative element, starting with the storyboard prior to the literary form. On the other hand the main character of your book In Italia sono tutti maschi, which you published recently, is set in a particular historical period and space. Where does this story come from, a research perhaps, and is there a special reason for it? The work is the opposite of Palmira and was created by Luco de Santis. All these stories are based on police records, kept in the State Archives; they’re prisoner testimonials, stories that were processed in a very detailed literary text. This belletristic text, the basis for the script, was brim with imagery; this example too features a narrative focus to objects, imbued with a vision, despite its textual origin. Objects became a symbol of compulsion or liberation, hope or despair, all depending on the circumstances. In the framework of a perfect scenario, I attempted to reconstruct the idea on the value of objects by showcasing images that assessed such elements. The story has more than ten characters, all male, and many of them have an equal narrative stress. It is set in the 1930’s, so it was difficult to distinguish between given characters. I worked extensively on gesticulation and tried to avoid stereotypes. Here too, I had my hands full with details. As opposed to other stories, on which you used the black-and-white technique, for example in Pranzo di famiglia and Monsieur Bordigon, in In Italia sono tutti maschi you use the two-color technique. Every time, I try to discover what works best, I try to understand which techniques are most suitable and learn new things. The two-color technique, used in In Italia sono tutti maschi is my first experiment of the sort. I work a lot with colors, mainly when it comes to illustrations, because of the editorial dimension that enables me to do so. I wish to work more with colors in my comics. Your approach, the manner of story-building is somewhat “dry”; the use of black and white accentuates it. Is this your way of work? I noticed I like the result when I start thinking in colors, I like what happens when I discover new things, because every work has its own dimension. In the project Tredici metri, which I developed for a competition, I started off with black and white, but later on I wanted to see the development of imagery and added two colors. The result was interesting. I found out that sometimes my style is inherent with a restriction, one that I didn’t impose myself, but was rather imposed on me. At this point, I’m trying to overcome it. Your manner of color use resembles painting, though in its essence it remains graphic. It’s becoming more painting-like; however, I don’t believe it’s losing on it strength. I use a digital effect that resembles paintbrush sketching. Yes. I like the somewhat imprecise contrast between the brush I use for applying the ink in a fairly dry manner and the flat color from the computer. I think they work. After all, my motto is “less is more”, so adding color doesn’t boost the drawing, but rather replaces parts that would be too heavy in black. I tried to use digital coloring, as if it were aquarelle painting and instill new freshness into the drawing. I’m very interested in such an experiment given the fact that up until now, I attempted to separate these two worlds: colors for illustrations, black and white for comics. In fact, I realized that colors work perfectly well in comics as an integral part of the drawing. I want to complete the story I mentioned before, Tredici metri, written by Francesco Satta a couple of years ago. Soon, I’m starting work on a new book I’m going to write and draw myself. Tredici metri is a story about a boy, coming back to a country of his origin, to the seaside, like every summer. He has a particular relationship with his cousin with whom he goes spear fishing. That is until his cousin steals his girlfriend and he is left with nothing but growing up. It’s a story about childhood myths and small havens, namely places to which people keep returning and believing each and every time they’ll find a piece of themselves in it, as if their childhood had stopped there. At one point they realize that the process of growing up affects all spheres of life and not only some. The other story I’m starting shortly, speaks of Italian immigrants in Switzerland in the 1950’s. I’ve been thinking about it for years and gathered a bundle of material. The only thing missing is the title. Do you prefer to work with a screenwriter or independently? Both. I used to prefer working with authors, because talking to people amuses me. I like the exchange of ideas, the dialogue with a person who can easily destroy your house of cards you’ve built in your mind in order to pinpoint what is missing. At this particular moment, I don’t mind independent work in the sense of being able to follow some non-traditional creative criteria, even in an intuitive way. I’m testing grounds; I’m in a phase of seeking new directions.